Jeff Lucero is a singer/songwriter, vocalist and guitarist based in Columbia, SC. Originally from Denver, CO, over the last 10+ years, he has garnered a reputation through touring the Southeast playing solo (and with his acoustic duo), along with his former bands, A Fall From Down and Namedropper. 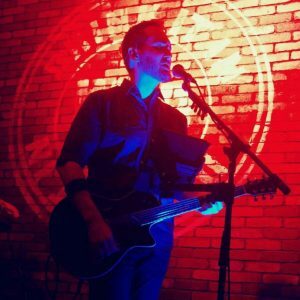 Averaging over 150 shows each of the past 3 years playing in 20 different cities, his acoustic shows feature hundreds of originals and cover songs, ranging from 60’s and 70’s songwriting classics to mainstream rock, grunge, soul and reggae, even fresh takes on current pop radio favorites. He is joined live and in the studio by drummer/vocalist Bart Ballington. His debut solo album featuring 8 brand new original songs, Revisionist History, will be released on June 15, 2018 and available on CD as well as through all streaming and download services online.